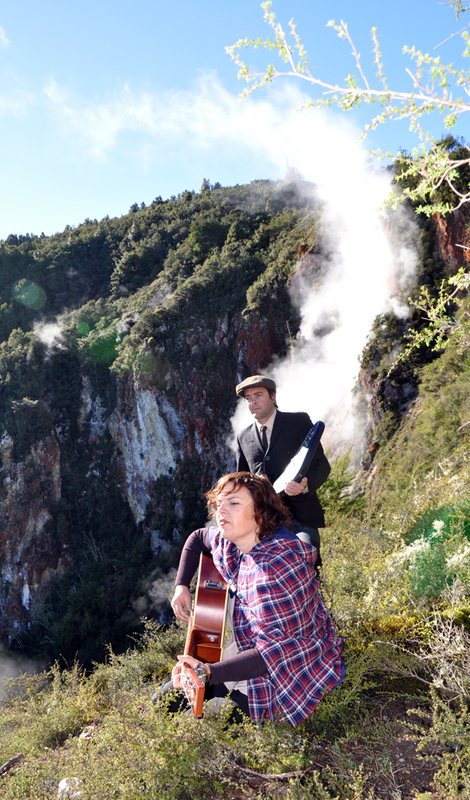 What do you get when two musicians are sent in song-writing exile to the scene of one of New Zealand’s largest volcanic eruption? You get a crackling new album rising from the ashes. 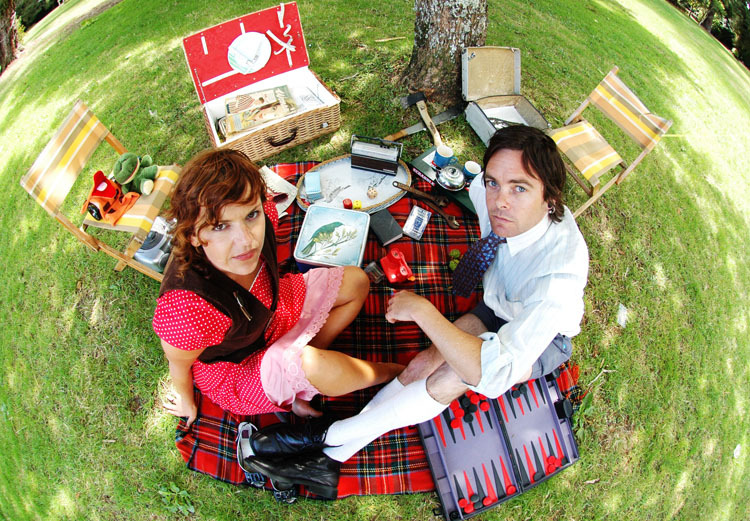 In 2010 Billy Earl (Andy Hummel -The Woolshed Sessions, Rhian Sheehan) and Betty Grey (Holly Jane Ewens) of Wellington folk duo ‘Rosy Tin Teacaddy’ spent six weeks on the shores of Lake Tarawera. The duo were the recipients of the Wild Creations artist in residence programme, a joint venture between the Department of Conservation and Creative NZ. They set out to research, write and record their translations of local history and isolation in a site-responsive manner. The result is a work that explores the lead-up to, and aftermath of, the 1886 eruption of Mount Tarawera and subsequent loss of the self-appointed eighth wonder of the world – the Pink and White Terraces. 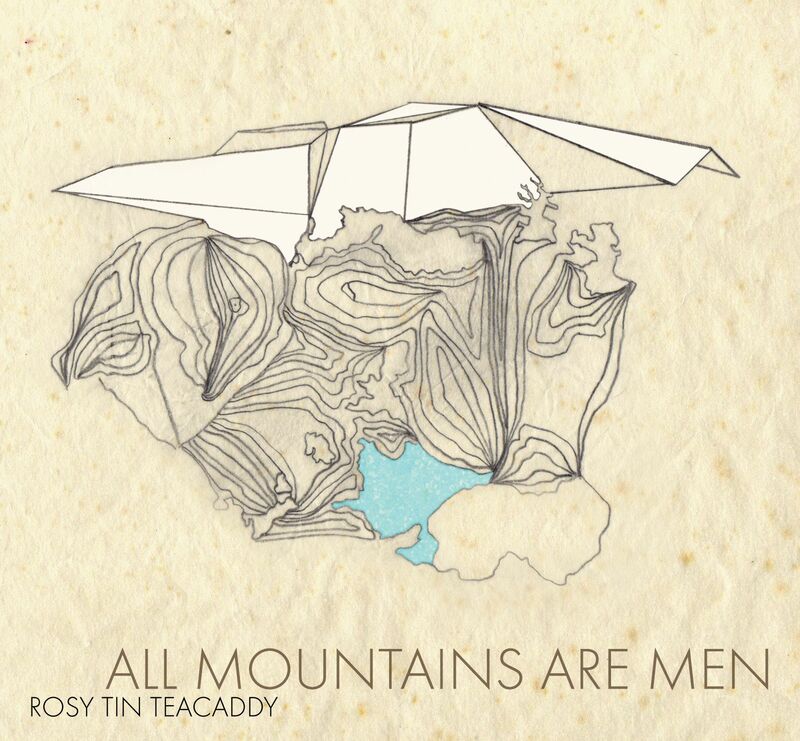 Rosy Tin Teacaddy have made use of historical anecdotes and found sounds (while holding fast to their harmonic and word-wizardry roots), in their new full-length release All Mountains Are Men. Presented with hand-numbered booklets, the album extends the duo’s artistic concept beyond the audio as they translate stories of the past into a present-day archival treasure. The BATS theatre show, ‘Coffee Cups and a Porridge Pot at Frying Pan Lake’ gave audiences a taste of this experience in May 2010. Forthcoming single Telegrams and Ashes, uses snippets from newspapers of the day with a dedication to the local telegraph master. Sitting on a bed of backwards guitar and finger-clicks there is little to suggest this album is merely two folkies strumming away in the back-blocks. There is cheek amongst the ruins too, with songs like Blow Your Top where the duo imagine the lake and mountain flirting with one another in a present context—’Facebooking, perhaps’, while the lament Beauty, My Dear swells with loss and hope—’Can’t have a clear sky, without a frost/Beauty, my dear comes at a cost’. Simultaneously cinematic and intimate, this album is layered as deep as the lake bed and seeks to provide fans with a slow burner through the cold winter months ahead. All Mountains Are Men will be released with a blessing by local kaumatua at Lake Tarawera on June 10, in conjunction with the 125th commemoration of the eruption of Mt Tarawera. 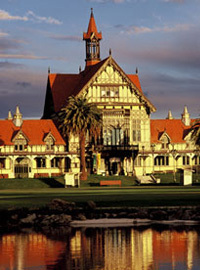 This will be followed at 7pm by a concert in the stunning historic Rotorua Museum of Art and History. 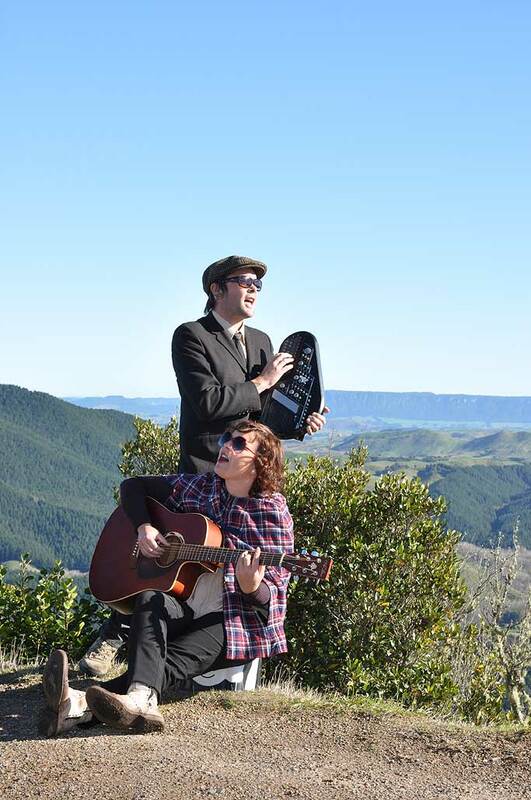 The following evening, Saturday June 11, Rosy Tin Teacaddy will play at the Buried Village, Te Wairoa, Lake Tarawera, joining Cornel de Ronde (GNS Science) as he shares his findings of recent exploration of the Rotomahana lake bed and the discovery of remnants of the Pink Terrace. For both these evenings, bookings are advised. Contact the Rotorua Museum (07) 350 1814, or the Buried Village (07) 3628287. Rosy Tin Teacaddy will be touring All Mountains Are Men throughout the country with Bond St Bridge (AKL) who is also promoting his new album, Spring Summer Awesome Winter. For more on Rosy Tin Teacaddy and their full line up of shows check out their Facebook page. Rosy Tin Teacaddy rolled into Rotorua a few weeks ago in a Toyota jammed full of chaos, for the first of their Wild Creations residencies. Billy Earl & Betty Grey are the creative geniuses behind the indie-folk band, Rosy Tin Teacaddy. 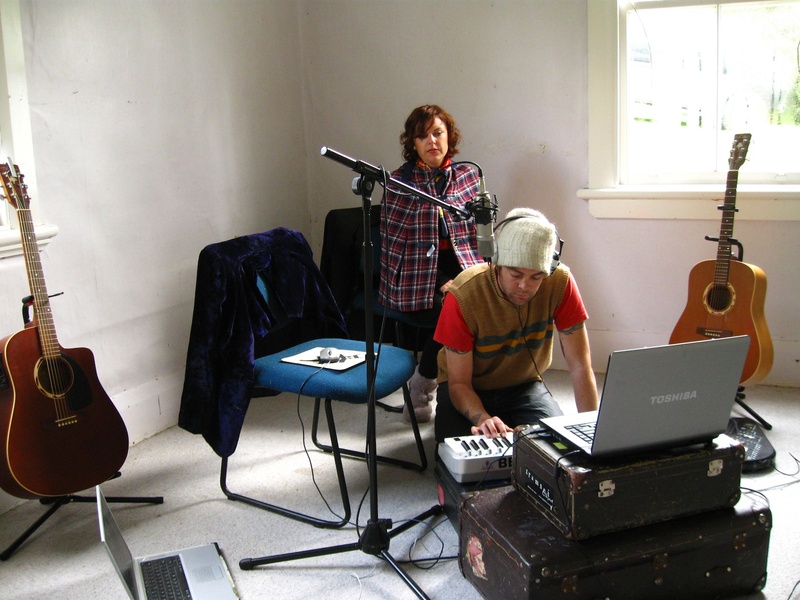 As apart of the Wild creations programme they have come up with the inspiring idea of creating a new collection of songs based on their experiences, the land, and the people and stories of Tarawera. The Wild Creations residency programme is a partnership between Creative NZ (Provides the funding) and the Department of Conservation (Host the artists) allowing great folks like Billy & Betty the opportunity to get away from it all and do what they do best – create! During their latest stay they have been out and about researching the area by day, visiting local ‘hot spots’ and catching up with locals etc. By night they can be found at their humble abode writing & playing. All this mixed in with numerous cups of tea of course! According to Billy & Betty this first stint has mainly been dedicated to devising their stage show, which is playing at BATS theatre May 19 to 22. “The show and the album project have become parts of the same thing. The show is almost the springboard into the project as a whole” comments Andy. “On our next visit to the area we are hoping to coincide the dates with the anniversary of the Mt Tarawera eruption (10th June 1886). Some may say that this is a great coincidence. I believe that it is somewhat serendipitous” says Betty. And, stay tuned for updates on a special Tarawera Anniversary gig in Rotorua! Recently I gave 3 NZ artists an early Christmas present when I told them they’d won a Wild Creations residency, meaning they will spend 6 weeks in some of NZ’s best natural environments to work on their art form. During the residency the artists explore and get inspired by their natural surroundings. They are all very different so they will each have a captivating story to tell about the places they visit. 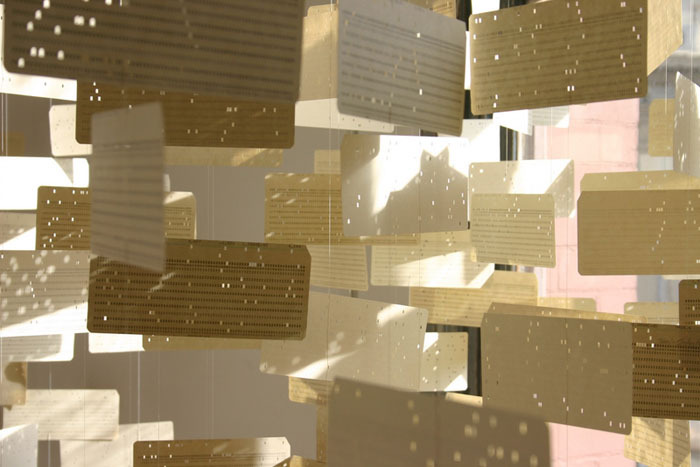 'Data Cloud' by Chris Cottrell. Based on the collection of weather data, this project shows a tangible bodily relationship to data's cloudy characteristics: indeterminacy, vastness, lightness, ephemerality and obscurity. One of the winning artists is Chris Cottrell. 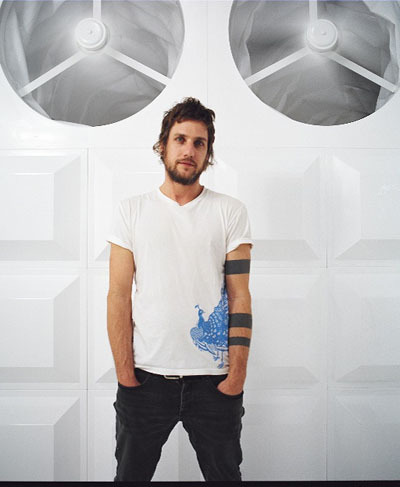 He’s a drawing, installation and video artist. 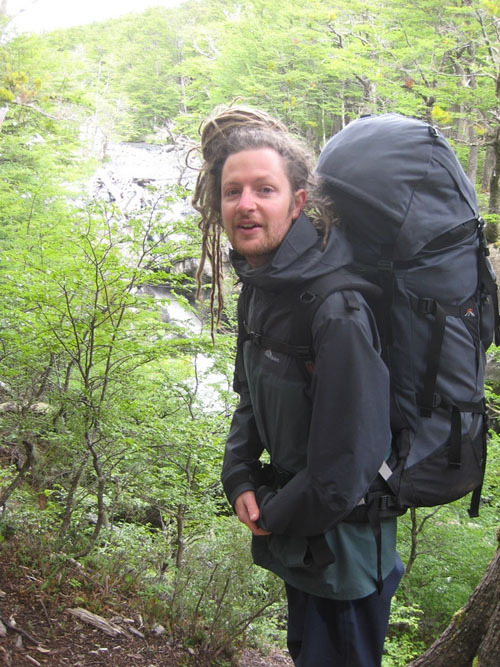 He’ll head to Fox Glacier where he wants to check out the glacier’s movements then draw, use GPS devices, video and sound to create maps of the glacier that shows the vitality and complexity of the environment. Chris hopes to showcase his work in a travelling exhibition and artists’ book after his residency. Chris is also keen to include the work in his upcoming PhD. 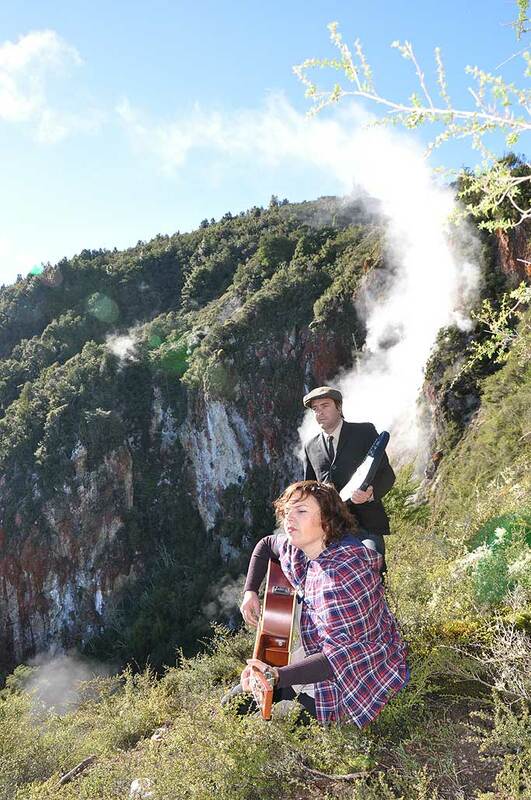 Andy Hummel and Holly Jane Ewens are the folk musical duo Rosy Tin Teacaddy. They’re going to the Rotorua Lakes region to write and record a new album about their experience, the people, and the history of Lake Tarawera. Judging by the music they’ve already produced their new album will be something special. Ashburton Lakes will welcome film, performance and soundwork artist, Hayden Fowler. He’s keen to create a performance piece based on the giant moa and kakapo that shows the impact of these birds being absent from mainland NZ. Hayden hopes to exhibit his work in galleries throughout New Zealand. DOC and Creative New Zealand work together on the Wild Creations Artists in Residence programme. Each of the winning artists gets a $5,000 stipend and up to $2,000 towards travel and materials costs from Creative New Zealand. DOC gives the artists accommodation during their residency and provides other support to make their stay safe and enjoyable.